HubSpot has a longstanding relationship with LinkedIn, ranging from product integrations to co-marketing campaigns. LinkedIn has chosen to work closely with HubSpot since it sees its customers benefit from the leading platform for growing businesses. Similarly, as the premier B2B social platform on the market, LinkedIn is an effective channel for HubSpot customers in the space looking to reach their ideal customer. 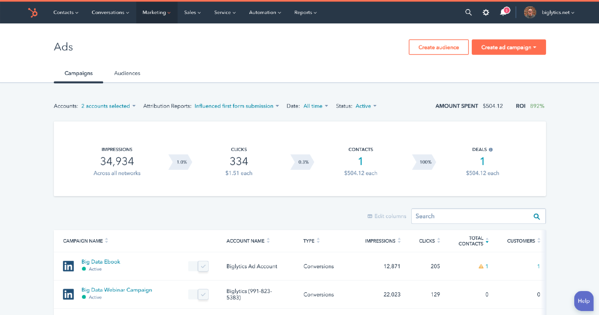 In addition to the LinkedIn ads integration, HubSpot also offers an integration with LinkedIn Sales Navigator and includes organic LinkedIn posting and analytics in its social media tools. To learn more about LinkedIn ads in HubSpot, please visit https://www.hubspot.com/products/marketing/ads. Ellie Flanagan is the Senior Corporate Communications Manager for HubSpot.